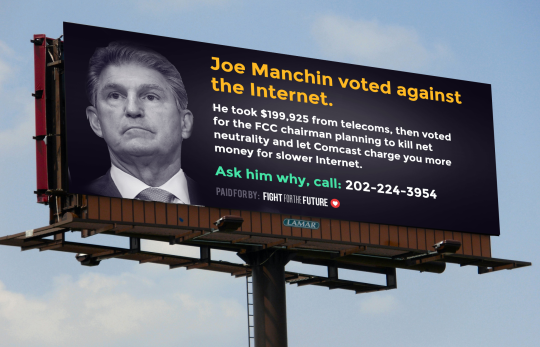 The four Democratic Senators who ignored overwhelming public support for net neutrality protections and voted to reconfirm former Verizon lawyer Ajit Pai as chairman of the FCC are among the first from their parties to be listed as part of “Team Cable” on a prominent “Congressional Scorecard” on net neutrality campaign site BattleForTheNet.com, run by Demand Progress, Free Press Action Fund, and Fight for the Future..
Fight for the Future also announced that they will target these lawmakers in their districts with crowdfunded billboards informing constituents of their Senator’s controversial vote. The group has previously targeted 9 members of Congress who have publicly supported Ajit Pai’s plan to slash Title II protections, but these four represent the first Democrats to be targeted as part of the crowdfunded campaign. See a mockup of what the billboards will look like here. Demand Progress, Free Press Action Fund, and Fight for the Future were the leading groups behind the massive July 12 net neutrality day of action, which drove a record breaking number of comments, calls, and emails, to the FCC and Congress.